returned in a paw print tin. returned in a wooden urn with Nameplate. 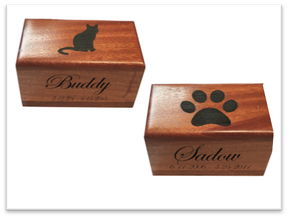 ​Pet is individually cremated with cremains (ashes) returned in this beautiful laser engraved personalized wooden urn. A sympathy card, personalized seed pack, certificate of cremation, all returned in our tote bag. 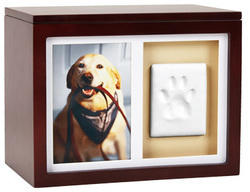 Pet is individually cremated with cremains (ashes) returned inside a velvet pouch, placed inside a beautiful memory box. A sympathy card, clay paw print, personalized seed pack, certificate of cremation, returned in our tote bag.